I was at a dinner party, held at a huge mansion lit with gaslamps. We were in one of the most conservative neighborhoods in one of the most conservative states in the union. But this was a party filled with liberals, and the whole enterprise had a feel like we were teenagers who had taken over someone’s parent’s house while they were away on a European vacation. We all nodded at the “smart conservatives” part. Some of my best friends could put William Buckley to shame in the brains (and political orientation) department. “Teddy Kennedy,” I offered, citing his fatal error at Chappaquiddick. 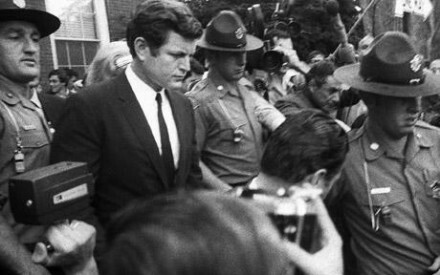 Edward Kennedy leaves court at Edgartown, surrounded by state troopers. Source: AP. She didn’t seem pleased by my comeback. It wasn’t what she meant. She wasn’t talking about life-stupid or moral-stupid. She was talking about book-stupid. And she was right. I didn’t know any stupid liberals, did I? That worldview is evident in several studies that have come out in the last few years that attempt to describe differences in the brain structure or thought processing styles of liberals vs conservatives. I have a number of problems with these studies — or, more properly, with the way they’re presented to us in the press. Good psychological studies often produce two responses in a trained reader. First, that is a really nice way to study that. “Elegant” is a word that is sometimes used to describe science well-done. Second, well duh. My child could’ve done that. We knew that already. Take the well-known Kruger-Dunning effect. It’s something we’ve known for a long time: stupid people don’t know they’re stupid. In a landmark paper (“Unskilled and Unaware of It”), Kruger and Dunning both gave hilarious case studies of stupid people doing cluelessly stupid things, but also described a series of elegant tests that supported a hypothesis most of us hold dear: it’s common to find blissful incompetence. So it is with studies of liberal and conservative brains. One can marvel at how well the studies are designed — and the studies I’ll cite here are not as clean as the Kruger-Dunning work but they are competently done. It’s the second response I want to examine. Well duh. Of course conservative brains work differently from liberal brains. That’s how conservatives and liberals come to different conclusions about the same set of data. The more recent developments have been attempts to find structural or functional processing differences between conservative and liberal brains. In 2007, David Amodio and coworkers looked at the ability of conservatives and liberals to complete a “Go/No-Go” task. Subjects were shown an M shape or a W shape (i.e., one letter was the flipped-over version of the other letter) and press the button only when one (say, the M) was presented, but not when the other (the W) was presented. So if we present you with a string of Ms, then a W, your brain has to switch from “go” mode (“press the button”) to “no-go” mode (“don’t press the button”). For example, children with ADHD have a difficult time with the “no-go” task. 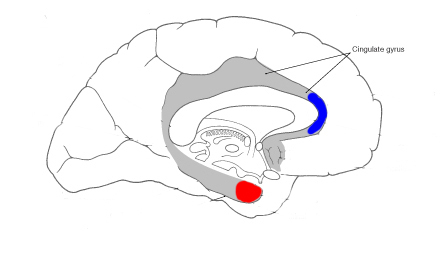 The limbic system (roughly corresponding to emotional areas of the brain) is shown in gray. The intelligent, adaptable blue color represents the anterior cingulate gyrus, which is said to be larger in liberals. The angry, fearful red color represents the amygdala, which is reportedly larger in conservatives. …higher tolerance of ambiguity and complexity, and greater openness to new experience on psychological measures. Two years ago, Nicholas Kristof wrote a delightful column for the New York Times describing different cognitive styles between liberals and conservatives. Simplifying it greatly (you should go read the column! ), liberals would slap their father if the situation demanded it, while conservatives would not. This harks back to the Authoritarian Personality model. The most recent buzz, which has brought at least a half-dozen “have you seen this?” messages in my email inbox, is by Ryoto Kanai and coworkers at University College London. It has the additional “wow” factor of being co-authored by Oscar winner Colin Firth. The study, “Political Orientations are Correlated with Brain Structure in Young Adults“, confirms earlier findings. The authors find the volume of the anterior cingulate gyrus is smaller in conservative brains than in liberal brains, consistent with less activity in those areas in conservatives as reported by Amodio. What’s new in the Kanai et al. study is that conservatives are said to have a larger right amygdala. The amygdala (“almond”) is known to be activated in fear responses. The quick-and-dirty conclusion that a neuroscientist would jump to, then, is that conservatives are afraid of more stuff. I have two problems with these reports, neither one of which is a criticism of the authors. First, I think self-reports of political orientation, or even responses to a political orientation quiz, are problematic. I think it’s easy to say things like “I’m a social liberal but a fiscal conservative” (I know, I say it all the time) but it’s hard to know exactly what I mean by that. A second problem is more subtle but more pervasive. In a 2009 Pew survey, only 9% of scientists self-described as conservative. Inadvertently, scientists may be falling prey to confirmation bias, the cousin of cognitive dissonance. We believe our own views to be good, true and right. (“Flexibility is good. Liberals are more flexible than conservatives.” or “Correctly identifying M and W on go/no-go tasks is good. Liberals are better at that than conservatives.”) When our hypotheses are confirmed, we stop looking. (“I always find things in the last place I look.”) I would feel a lot better about these studies if they identified things (other than fear) that conservatives are better at. interesting, thanks for the cogent summary. The thought occurs to me: what happens in the brain of a liberal with ADHD? The funny thing is, my personal “fan base” is chock full o conservatives. As a liberal with ADHD I’d be happy to volunteer as a test subject! That’s a good question. Another way of thinking about it: if the same factors predispose someone to both ADHD and conservatism, is there a higher incidence of conservatism among those with ADHD? I honestly don’t know. Maybe someone will do that study. I’m no scientist, but it seems to me the thing that sets liberals apart from conservatives is liberals are generally much more expansive in their thinking and their way of interacting with the world.